The graffiti, scrawled in red and orange paint across the wall and windows of the campaign headquarters on King Street. 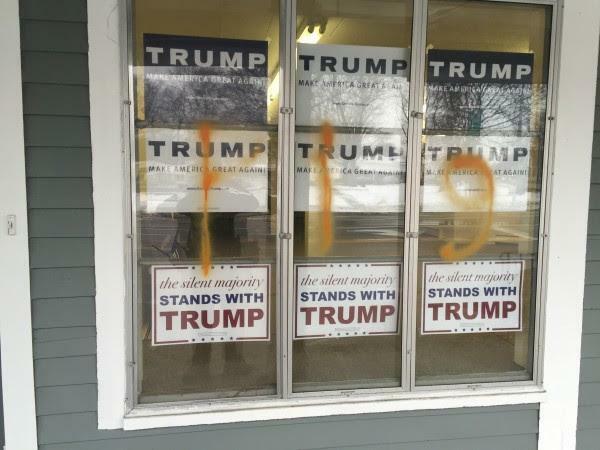 Donald Trump’s Massachusetts campaign headquarters in Littleton was discovered vandalized with graffiti and obscenities on Saturday morning. Around 9 a.m. Saturday, a Littleton police officer in a marked cruiser near the town common was approached by a woman who reported the vandalism, according to a police statement. Police plan to review surveillance footage in the area, including a nearby gas station, according to the statement. The Republican presidential candidate’s headquarters opened in December at 492 King St. in Littleton, said Dean Cavaretta, director for Trump’s Massachusetts campaign. “We’ve had some outstanding volunteers come by and clean [the graffiti] up since,” said Cavaretta. The campaign headquarters is located inside the historic Conant Building, a large commercial building which also houses other businesses. The Conant Building was established in 1840 as a cooperative by town residents, according to the police statement, and has served throughout the years as a general store, stable, post office, grocery store, barbershop, and cobbler. Littleton police ask anyone with information to call 978-540-2300.